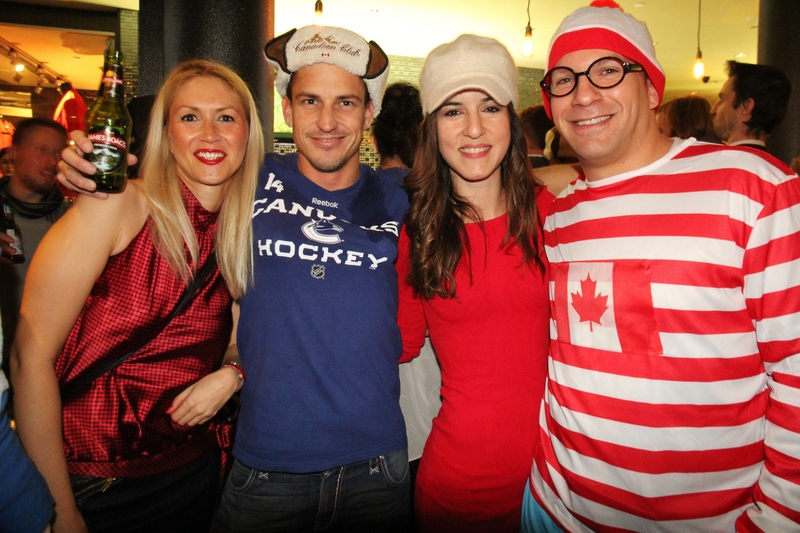 It is hard to get official figures on how many Canadians live in Australia, but it was about 30,000 back in 2006. 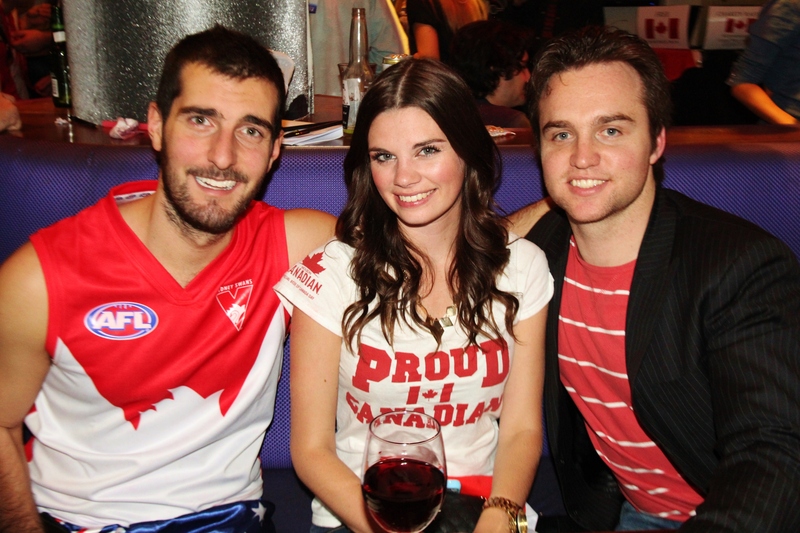 The first Canadians came to Australia were convicts. 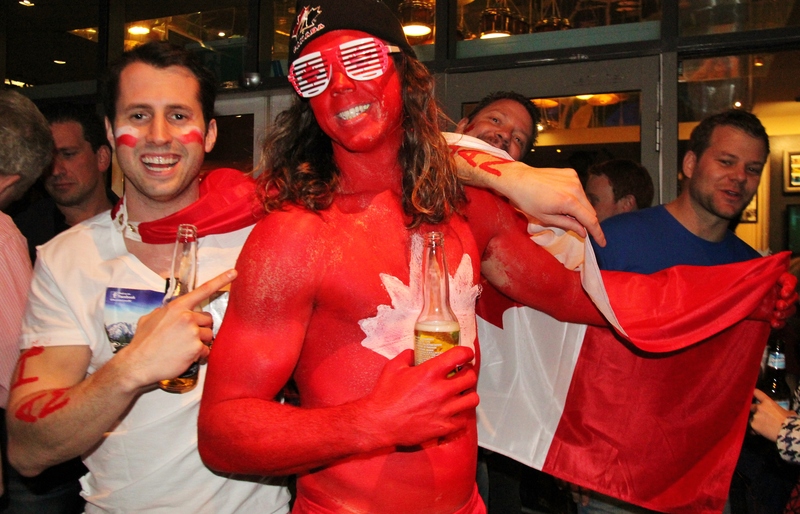 They were transported to Australia for their part in the political uprisings in Upper Canada (now the province of Ontario) and Lower Canada (now the province of Quebec) back in 1837-38. 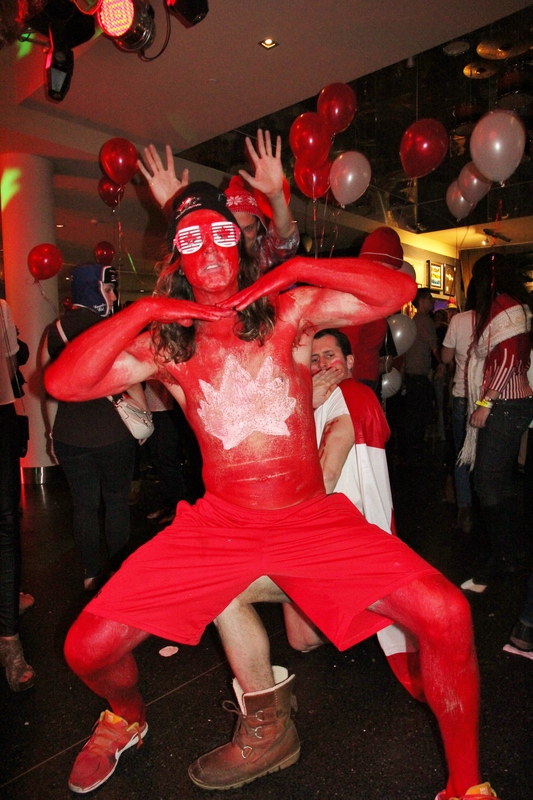 A total of 154 Canadian state prisoners were sent to Australia. 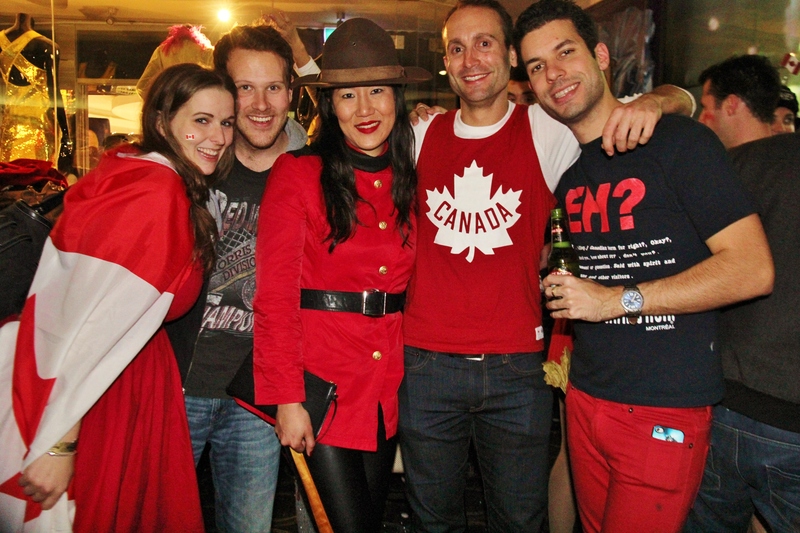 Since then, Canadians have been coming to Australia as free citizens, enjoying the similarities between the two nations. 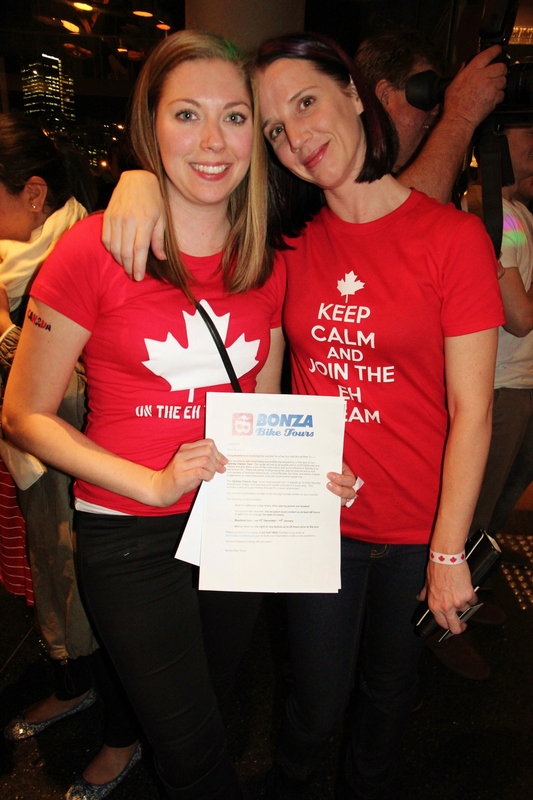 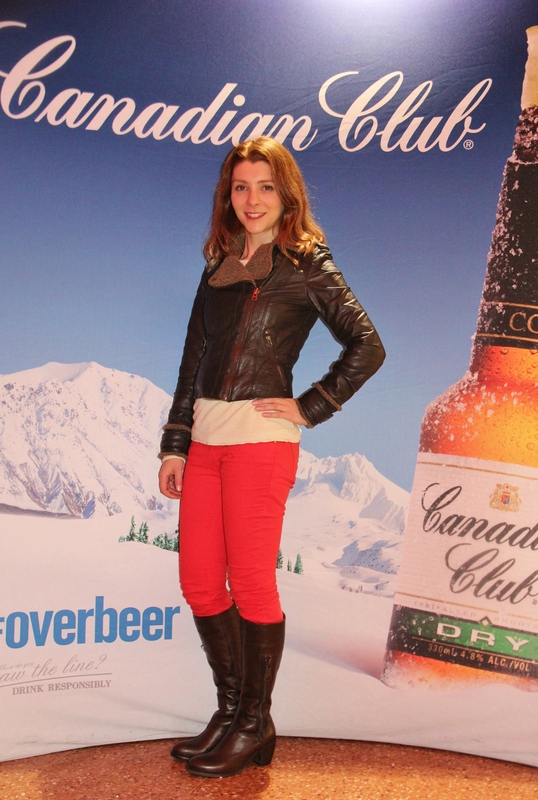 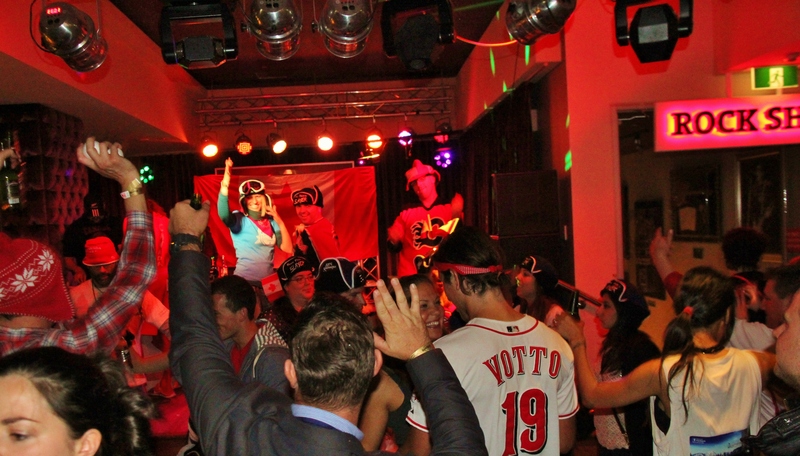 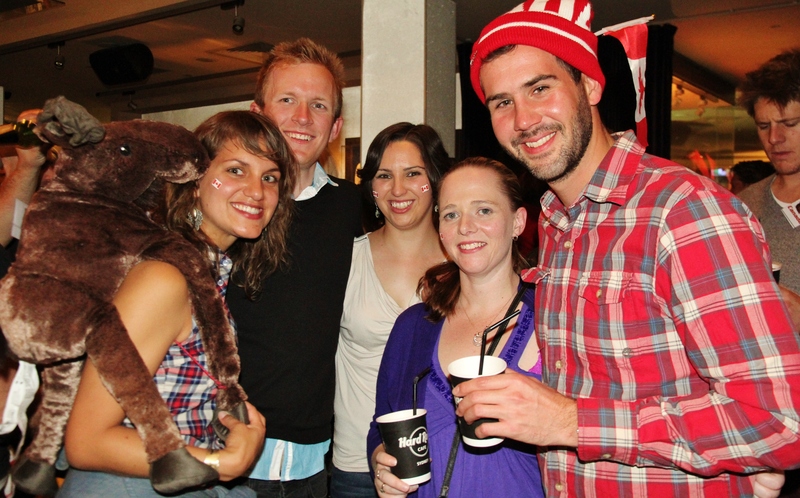 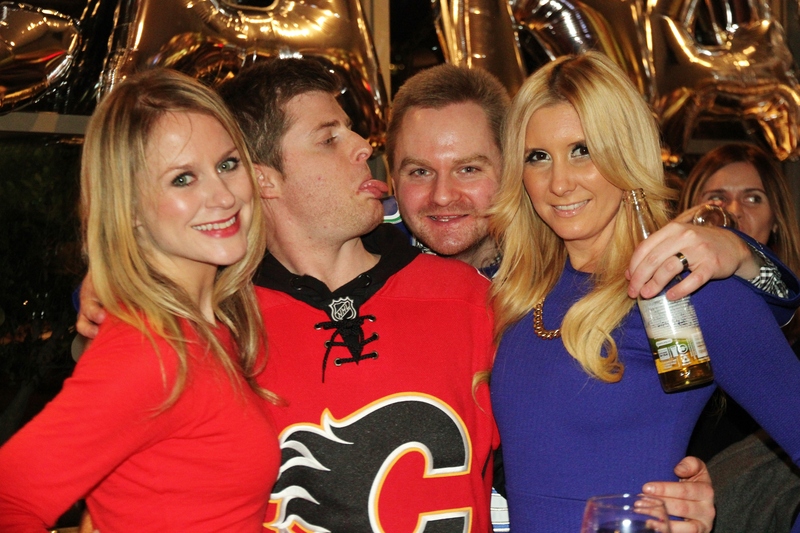 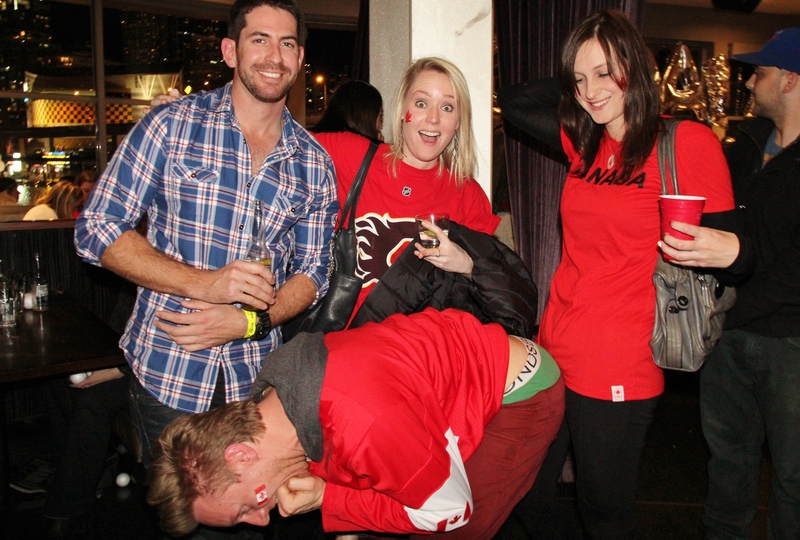 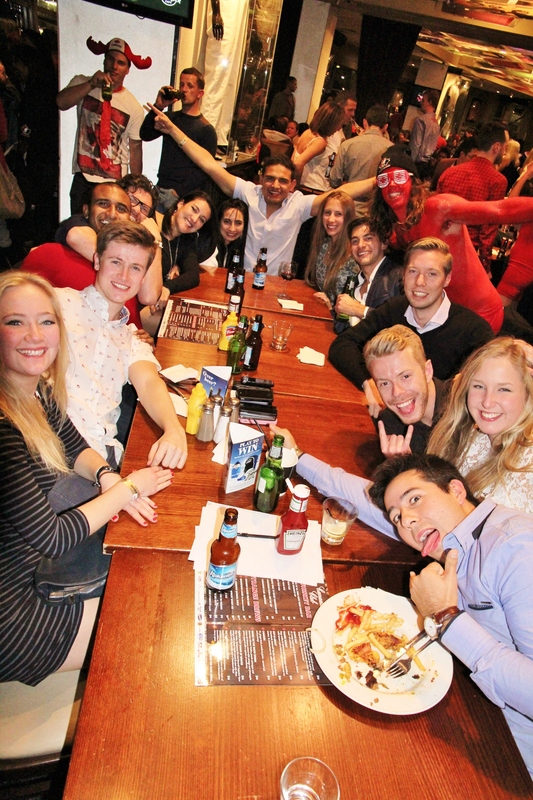 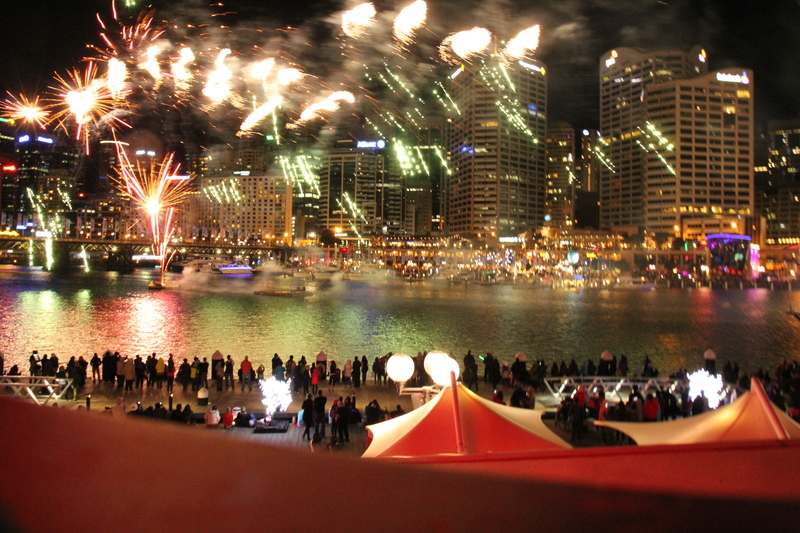 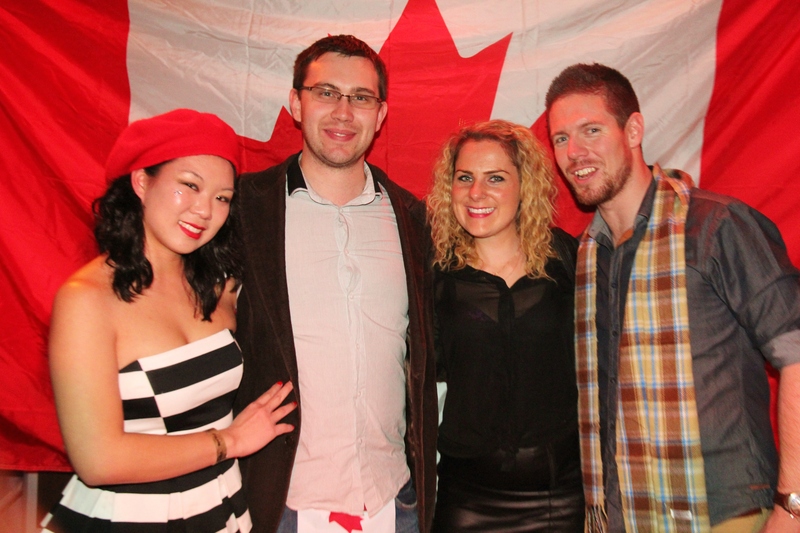 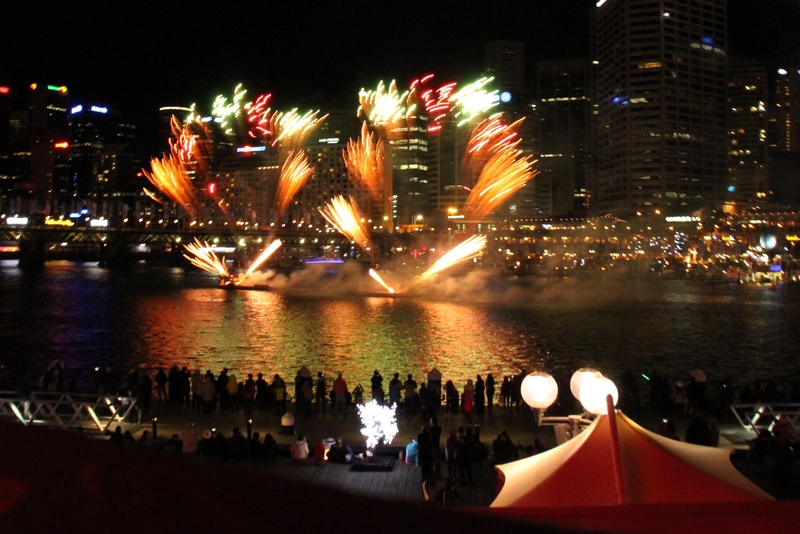 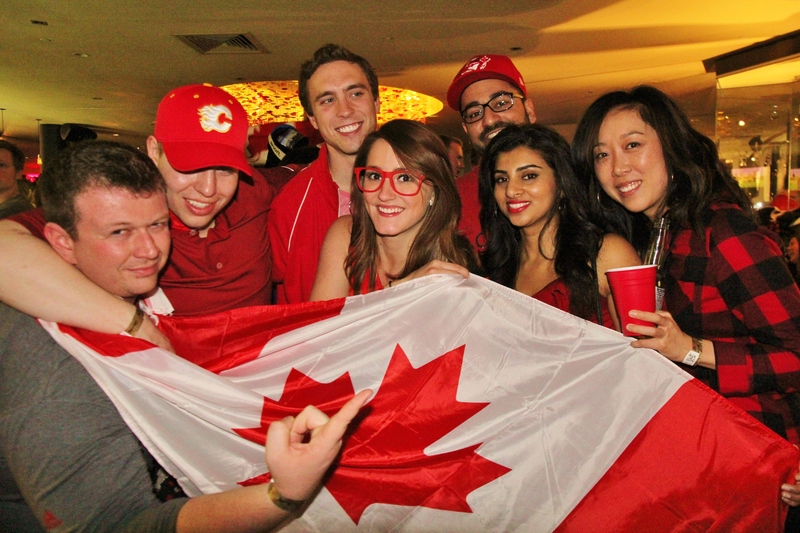 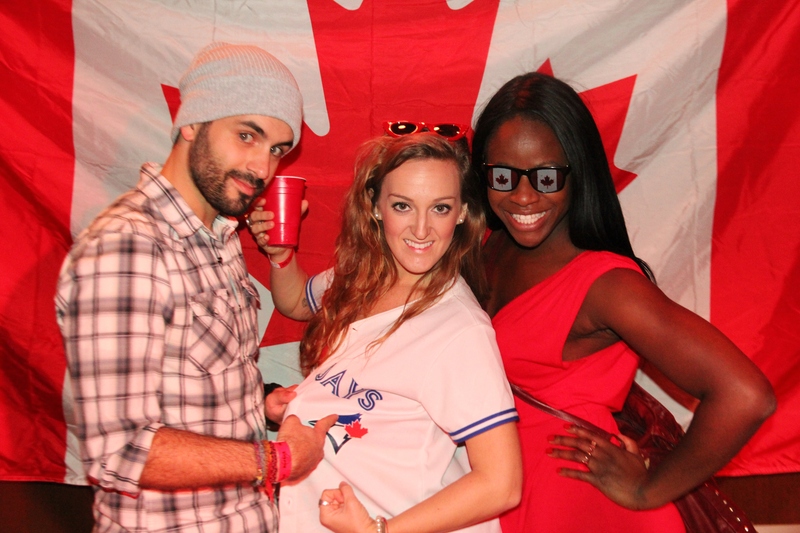 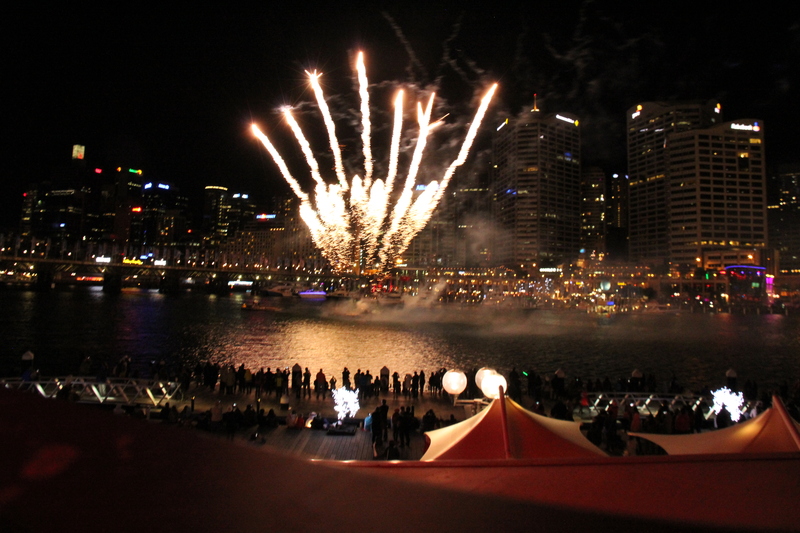 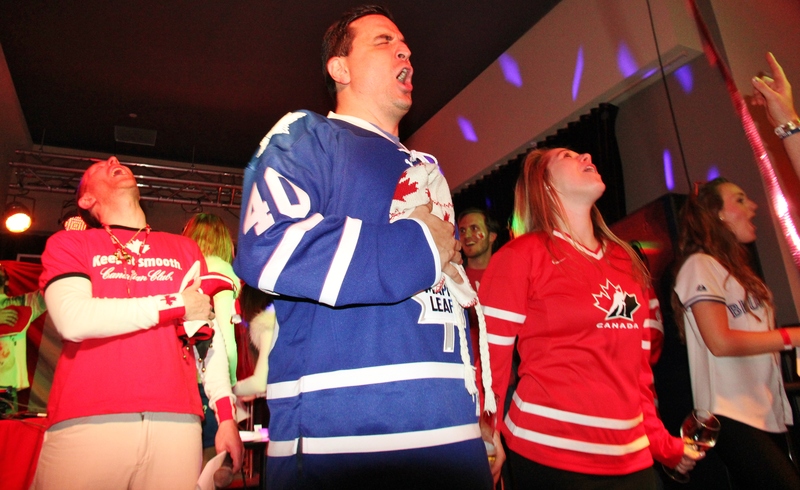 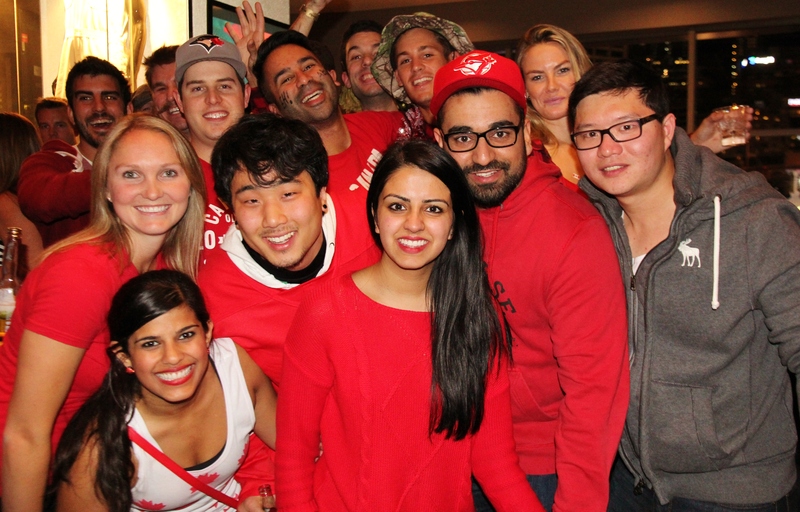 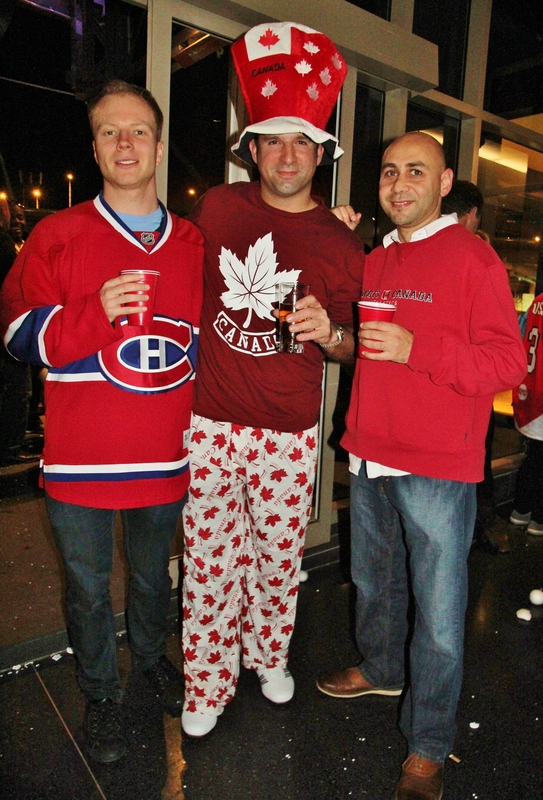 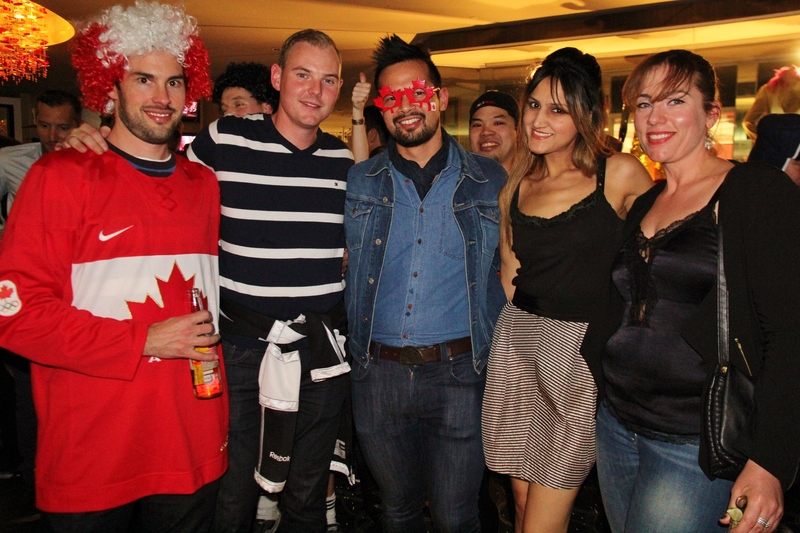 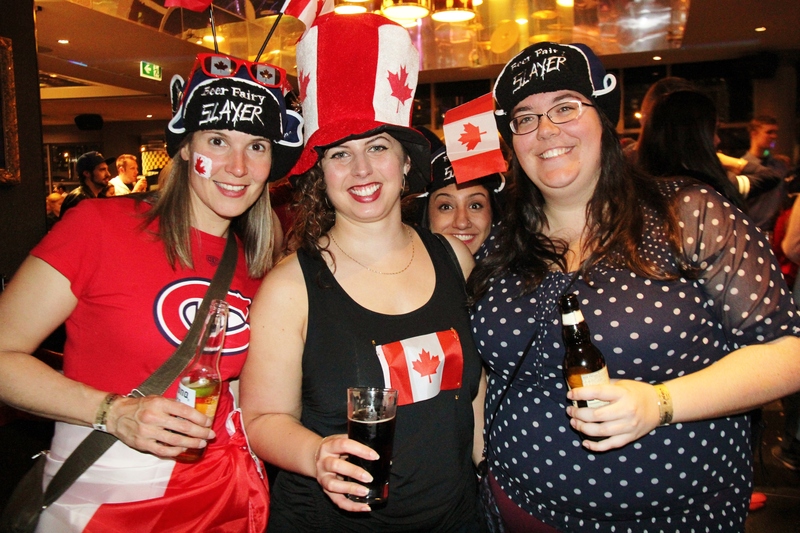 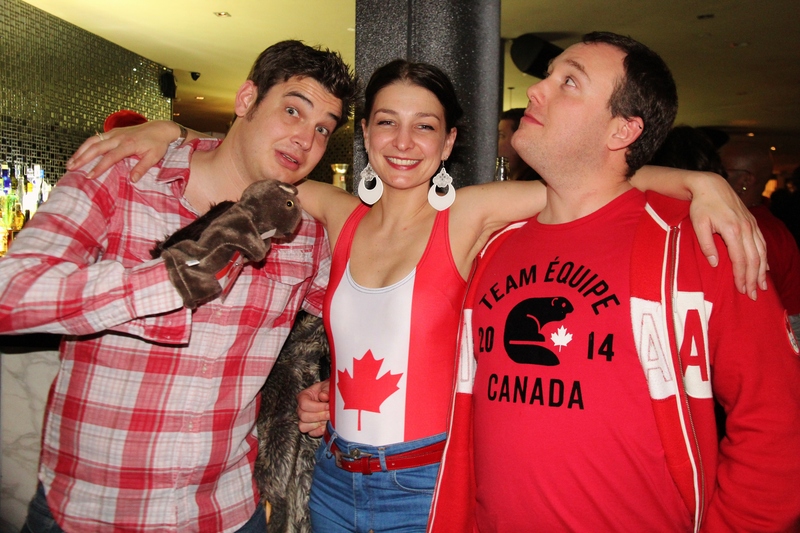 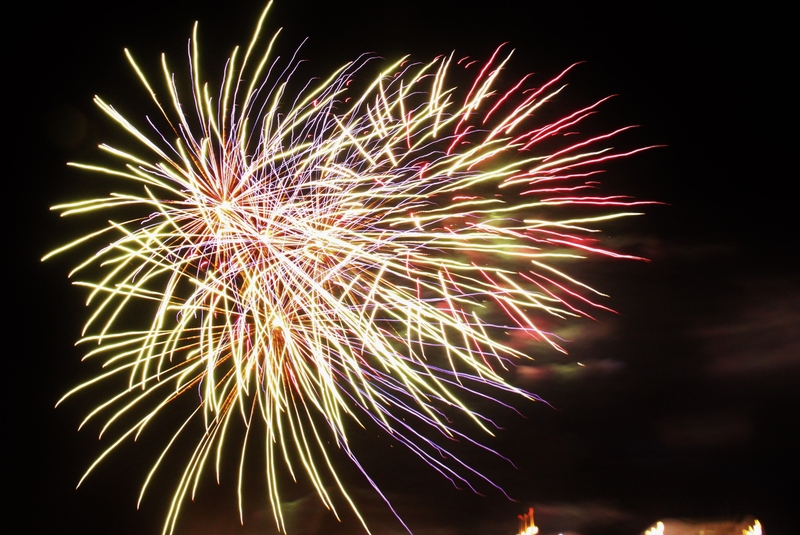 On Saturday 28 June 2014 Canadians gathered at the Hardrock cafe Sydney and Cohibar for the biggest Canada Day party in the Southern Hemisphere. 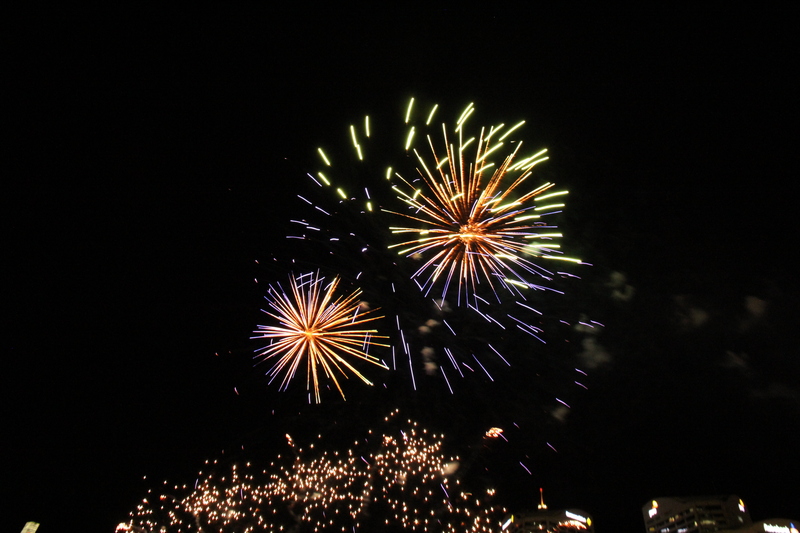 Over one thousand people rsvped to the event. 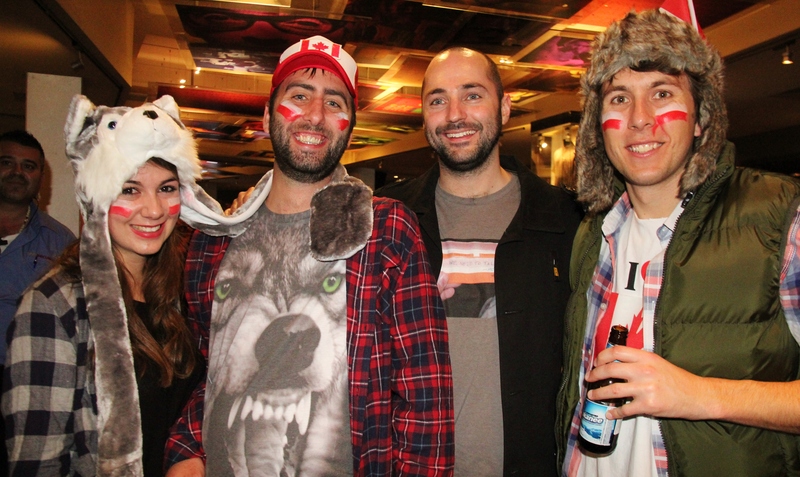 There were: two separate DJ areas with DJ Sasha Viacich manning the deck at the Hard Rock Café; trivia which started at 5pm, snow ball fights with white foam balls; snow produced by a snow machine; $15,000 worth of prizes and giveaways including a trip to Canada; and Canadian Day fireworks at 8:30pm. 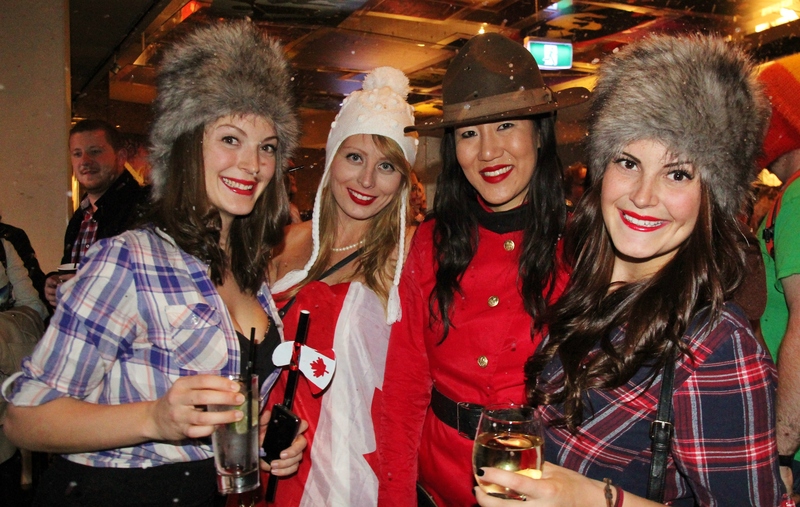 Promotional girls from Kreate Australia handed out Canadian Club whisky branded hats, scarfs, beer stubby holders and watches. 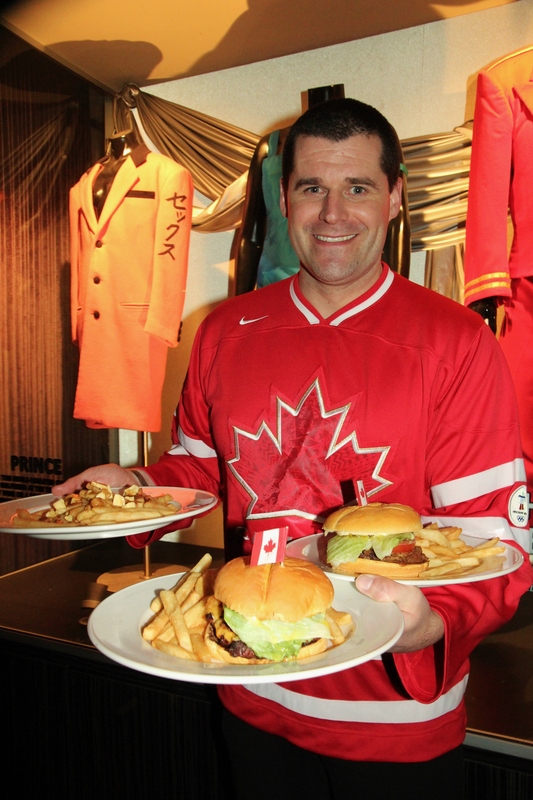 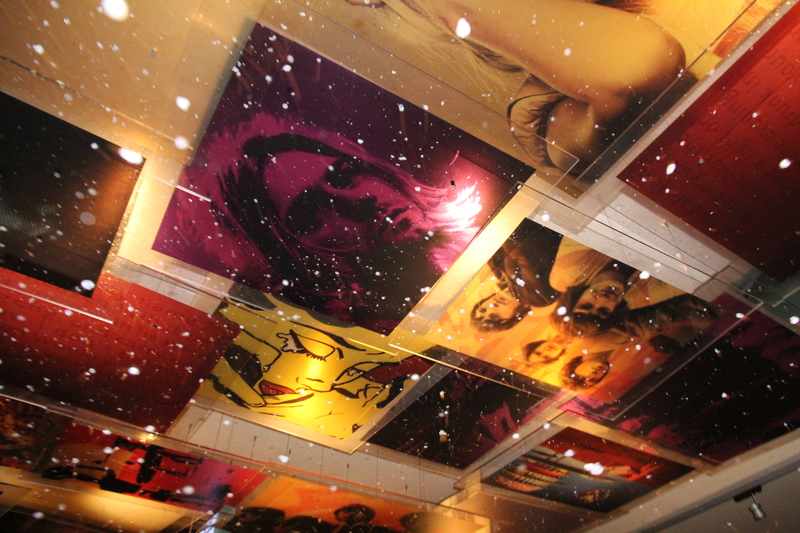 The menu of the Hard Rock Café was Canadianised for the night. 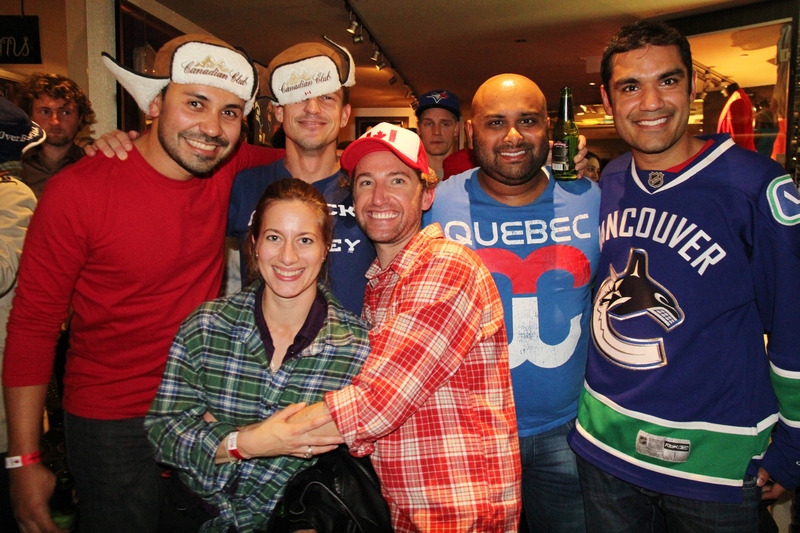 Canadian food included as Fatboy burgers, beaver tails (a fried dough pastries hand stretched to resemble a beaver tail), chilli dogs (a hot dog garnished with chilli con carne), perogies (a dough dumpling stuffed with potato and cheese and served with onions and sour cream), buffalo wings and poutine (chips topped with cheese, curd and gravy). 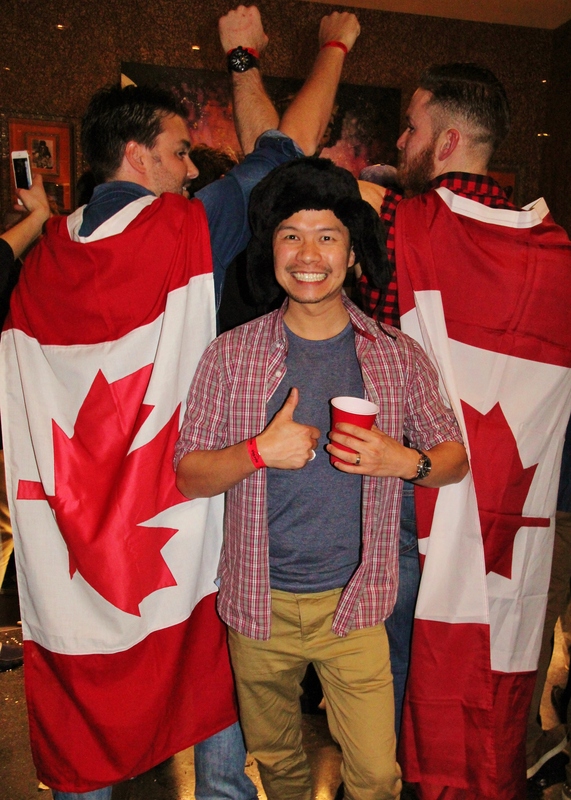 Over 50kg of curd got shipped in from Canada to make the poutine. 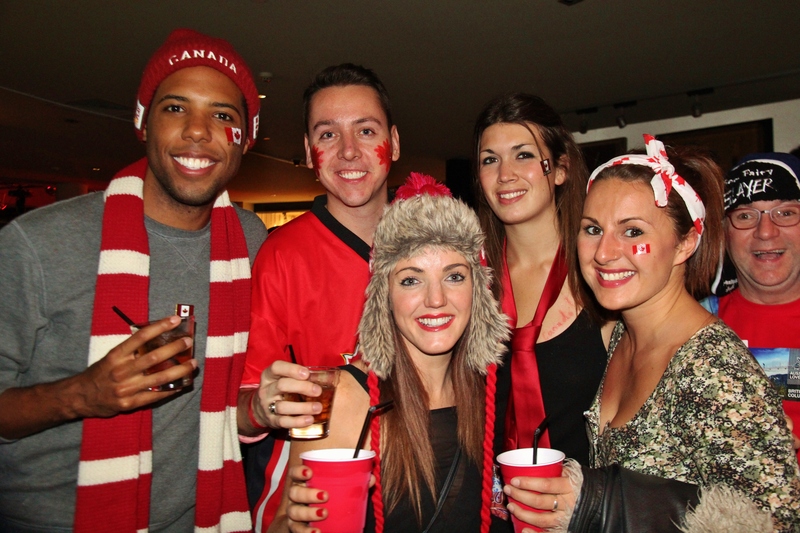 They were serving 6, 12 and 20 year old Canadian Club Whisky, Canadian Club Whisky slurpees, and cocktails with the names of Maple Leaf, Prairie Sunset, Out-n-about, Chinook, Riders on the Snow Storm, Purple Hazy Shade of Winter, and Saskatoon Slammer. 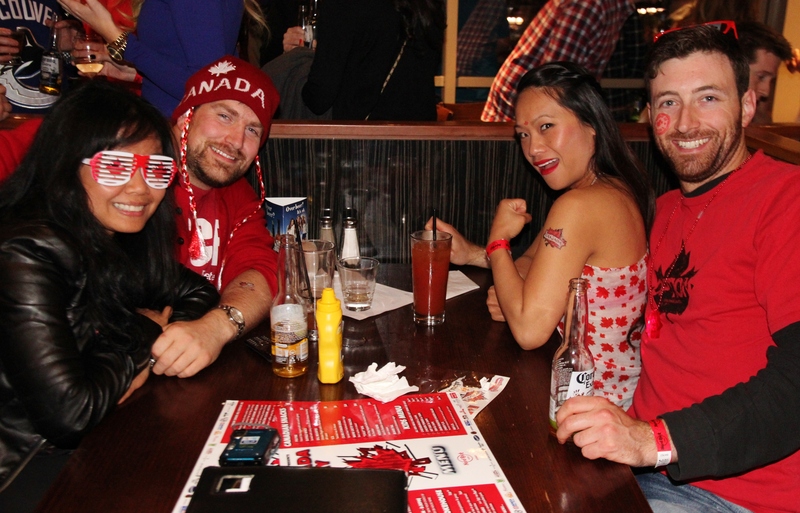 Caesars (not the salad) were the most popular cocktail, containing vodka, clamato (a proprietary blend of tomato juice and clam broth), hot sauce and Worcestershire sauce served in a salt-rimmed glass and garnished with a stalk of celery. 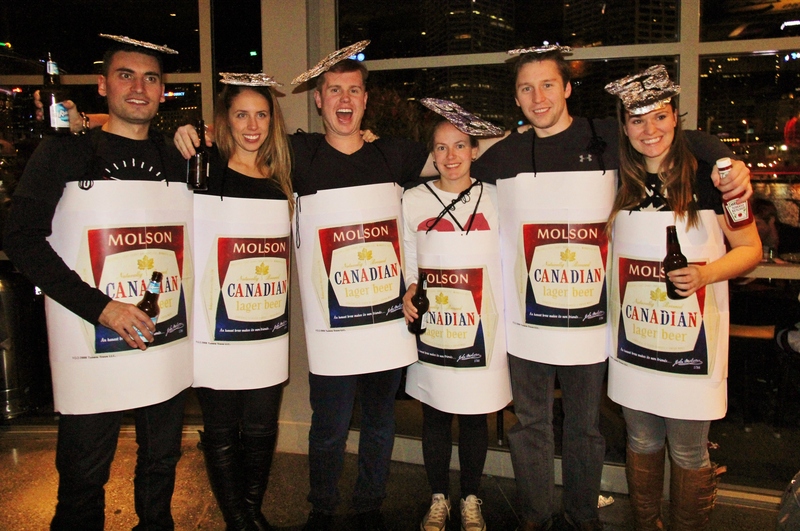 Two hundred litres of Clamato got shipped in from Canada just for this drink and bartenders were specially trained to make it. 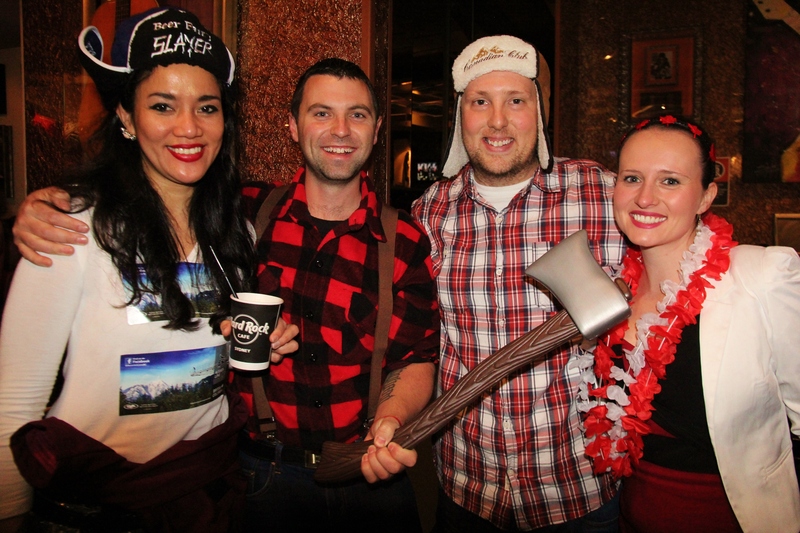 The beers included Moosehead Lager, La bière St-Ambroise (oatmeal stout, apricot wheat ale and a pale ale), Dieu de Ciel (blanche de paradis, route des epices and rosse d’hibiscus) from a microbrewery in Quebec and Kokanee beer (which is the number one selling beer in British Columbia).